A white gay man against a self-hating black gay man. and probably a a stereotype of a homophobic (I guarantee christian) black 22 year old female Mississippi college student on CNN.. You can’t make this stuff up. 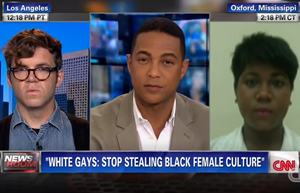 As for Don Lemon who conveniently forgets to quote Ms. Mannie as writing “for which black male you’ve been bottoming” and his “when you’re TRYING to be cute or funny or gay” (?!?!). You are not only a disgrace as a gay male but also as a television newsman.